Citation Information: JCI Insight. 2019;4(5):e124202. https://doi.org/10.1172/jci.insight.124202. Atopic dermatitis (AD) is a complex inflammatory skin disease mediated by immune cells of both adaptive and innate types. Among them, CD4+ Th cells are one of major players of AD pathogenesis. Although the pathogenic role of Th2 cells has been well characterized, Th17/Th22 cells are also implicated in the pathogenesis of AD. However, the molecular mechanisms underlying pathogenic immune responses in AD remain unclear. We sought to investigate how the defect in the AD susceptibility gene, Ets1, is involved in AD pathogenesis in human and mice and its clinical relevance in disease severity by identifying Ets1 target genes and binding partners. Consistent with the decrease in ETS1 levels in severe AD patients and the experimental AD-like skin inflammation model, T cell–specific Ets1-deficient mice (Ets1ΔdLck) developed severe AD-like symptoms with increased pathogenic Th cell responses. A T cell–intrinsic increase of gp130 expression upon Ets1 deficiency promotes the gp130-mediated IL-6 signaling pathway, thereby leading to the development of severe AD-like symptoms. Functional blocking of gp130 by selective inhibitor SC144 ameliorated the disease pathogenesis by reducing pathogenic Th cell responses. Our results reveal a protective role of Ets1 in restricting pathogenic Th cell responses and suggest a potential therapeutic target for AD treatment. Ets1 expression is significantly reduced in skin lesion of severe AD patients and experimental animal model. (A) H&E staining of the human skin biopsies confirmed the clinical diagnoses of weak, moderate, and severe atopic dermatitis (AD). Ets1+ lymphocytes were analyzed by IHC in the same tissues. (B) Frequency of Ets1+ lymphocytes from AD patient group with different disease severity is summarized in the graph. The data are expressed as mean ± SEM. ****P ≤ 0.0001; 1-way ANOVA. (C) After 4 weeks of AD induction in BALB/c mice, expression level of Ets1 was analyzed in peripheral CD4+ T and CD19+ B cells from skin-draining LNs by qPCR or immunoblotting. Quantification represents 3 independent experiments. 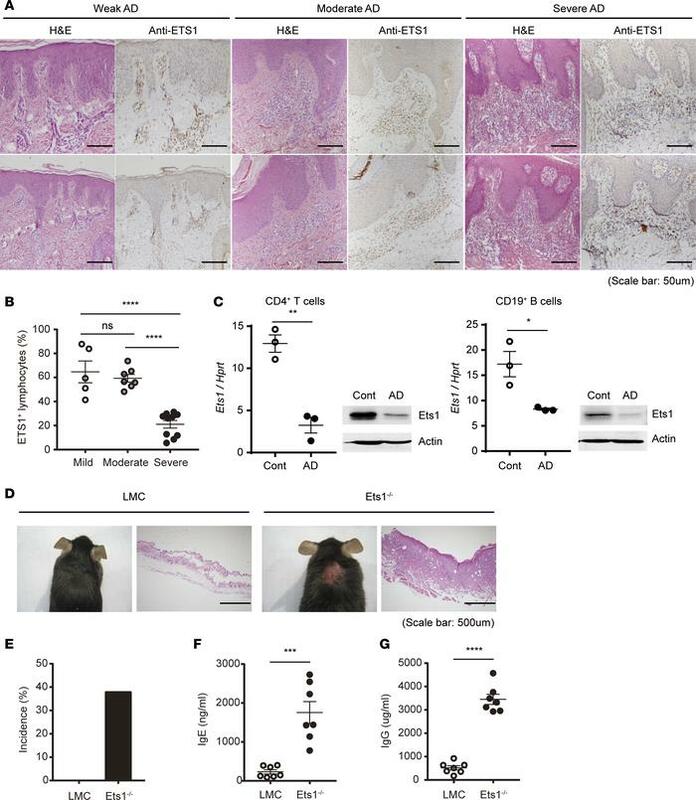 (D) Representative phenotype of spontaneous AD-like skin inflammation developed in Ets1–/– mice (in C57BL/6 genetic background) under conventional conditions. (E) Incidence of AD-like skin inflammation among age-matched littermate controls (LMC) and Ets1–/– mice was calculated (n = 43 of LMC and 21 of Ets1–/– mice). (F and G) The total IgE and IgG levels in serum from mice groups at 12–16 weeks kept in conventional conditions were measured by ELISA (data comes from the analysis of 7 individual mice in each group). Error bars represent the mean ± SEM. *P ≤ 0.05; **P ≤ 0.005; ***P ≤ 0.0005; ****P ≤ 0.0001; Student’s t test.